This Oil Stock Should Be Killing It in 2018. Here's Why It's Not. Even though Patterson-UTI Energy provides two must-have services for North America's shale revolution, it keeps on posting losses. With oil production growing by leaps and bounds in North America, oil services provider Patterson-UTI Energy (NASDAQ:PTEN) should be doing much better than its posted earnings results so far this year. The company provides two essential services for shale drilling: high-specification rigs capable of handling complex shale jobs, and pressure pumping services to frack shale wells and get them producing. Despite being right at the heart of booming shale production, the company continues to post losses. Is this company doomed to keep posting losses, or has the company made some significant progress toward becoming profitable again? 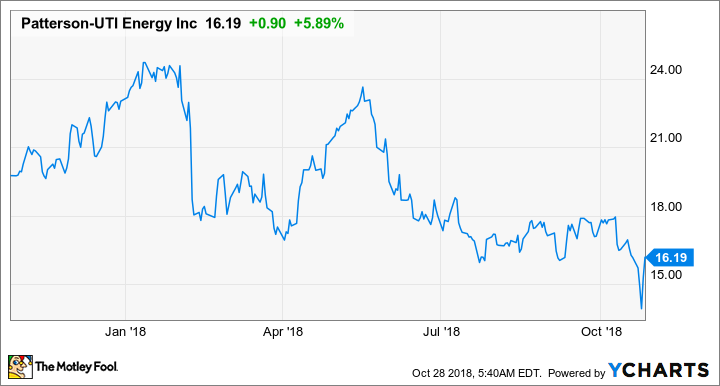 Let's look at Patterson-UTI Energy's most recent results and figure out whether it can start posting profits in 2019. Data source: Patterson UTI Energy earnings release. EPS = earnings per share. Patterson-UTI Energy is hitting a rough patch in the North American oil and gas market, especially in pressure pumping -- also known as fracking. Shale basins across the U.S. are testing the limits of pipeline capacity, and that's forcing several oil and gas producers to tap the brakes on their drilling programs. As a result, companies in the fracking business -- both service providers and sand suppliers -- are taking it on the chin right now. One thing that made this quarter look even worse, by comparison, was the decision to retire 42 of its older legacy rigs and take a $48.4 million impairment charge. As management noted, these are older rigs that aren't easily upgradable to the required specifications needed for today's drilling jobs and will have, according to the press release, limited commercial opportunity. Absent this impairment charge and impairments for some of its pressure pumping equipment, Patterson's adjusted loss per share would have been about $0.10. It's still a loss, but it is drastically better than the reported result and was better than analyst expectations for the quarter. Data source: Patterson-UTI Energy. Chart by author. Something else to consider when looking at these results: Because the company has been spending a lot of capital on upgrading rigs, it has high depreciation costs. Those non-cash expenses, combined with non-cash impairment charges, mean the company's earnings are much worse than the company's cash flow situation. Management has felt comfortable enough to both pay its dividend and buy back about $100 million in shares so far this year, even though it has consistently posted losses. It goes to show how much those non-cash expenses are taking a toll on the bottom line. During the company's conference call, management did acknowledge that there are a few potholes in the road to growth. Without takeaway capacity in pipelines, producers are going to delay fracking wells to start production. This inventory of drilled, uncompleted wells will get tapped as pipelines get built, though, and will lead to an uptick in the pressure-pumping business. The favorable macro environment is already apparent in contract drilling, which accounted for approximately two-thirds of our EBITDA. We see great value in our position as a leading provider of super-spec[ification] rigs. Let me reiterate [CEO Andy Hendricks'] comments that super-spec rigs are largely sold out, requiring operators to get in the queue and wait for an upgrade, if they would like to add an incremental super-spec rig. This queue and the resulting conversations about longer-term drilling plans is allowing us strong visibility into future super-spec rig demand. Additionally customer appetite, for term contracts in a rising day rate environment confirms the super-spec drilling activity should remain strong. You can read a full transcript of Patterson-UTI Energy's conference call on fool.com. Impairing assets and admitting they aren't profitable anymore is always discouraging, but it was the right move for this company. Companies want high-spec rigs today, and demand for rigs that don't have the necessary horsepower to drill for miles at a time or the ability to quickly move from well to well on a single drilling pad is almost nonexistent. Getting rid of these assets now is akin to ripping off a bandage: It stings now, but not having to spend on upkeep for those rigs will improve margins down the road. As the market for high-spec rigs remains tight and the amount of upgradable rigs dwindles, it should help boost pricing. Also, the pressure pumping business is going to be held back by pipeline capacity for some time. Once new pipelines get built -- there are millions of barrels per day of pipe under construction -- we can expect producers to work down their inventory of drilled, uncompleted wells. Chances are that Patterson's results will look pretty rough over the next couple of quarters. Afterward, though, we should start to see a return to profitability. Fortunately for investors, the company is still generating enough cash flow to keep its dividend payment and buy back shares while they're cheap. Its stock trades for 0.9 times book value, which is about where it was during the Great Recession. It's not the best stock in the rig industry, but there is certainly opportunity for improvement. These 3 Oil Stocks Are Down 25% in 2018. Should You Buy Now?